The Sydney Boat Show is on from 28 July to 1 August and Eco Boats will be there at the Power Equipment stand. See Torqeedo products at stand 407 in the Glebe Island Exhibition Centre — look for the Power Equipment stand. Power Equipment are the Yanmar distributor for Australia, so keep a lookout for Yanmar signage as well. 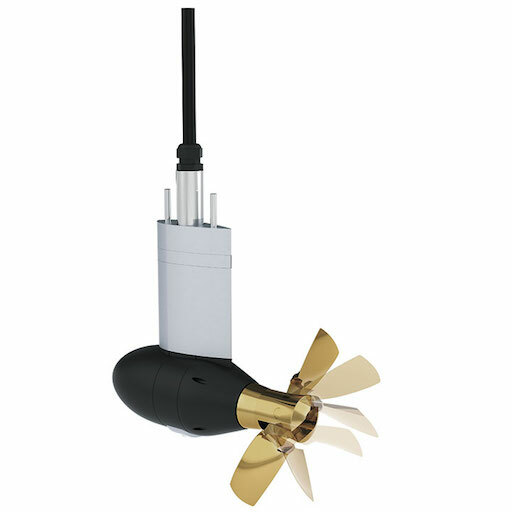 These are the natural evolution from the Cruise outboard series and with some added benefits. The pod drive is very robust with critical elements strengthened continual life underwater and with the option of a folding prop for streamlined shape when sailing. Throttle control has been fine tuned so that more power is available momentarily while manoeuvring at close quarters, and more power is available in reverse. The Cruise 10 Outboard is ideal for a cruising catamaran and when matched up with a quiet diesel generator makes an ideal cruising platform. Its common for cruising cats to have three diesel engines, one for each hull and one for house power — now these can be rolled into one, the space normally allocated for port and starboard engine rooms are now freed up for accommodation of other uses. A single optimised diesel genset is very economical and ideal for getting the most out of a tank of fuel. A DC genset can always run at optimum efficiency and its energy can be stored in highly efficient lithium batteries with almost zero loss of power is the charge/discharge cycle. Now with the Cruise 10 outboard and pod available, we find an ideal match for 12 to 15 m catamarans. Come along to the stand and find out more about them. A new 1003 battery with close to double the capacity of the standard battery will be available with the next two weeks. The new battery is the same physical size and just a little heavier, and with plenty of extra capacity at 915 wh. Any outboard or ultralight orders received until midnight 1st August will receive a free Torq Trac smart phon app.